MAE SAI, Thailand -- "Everyone is safe." 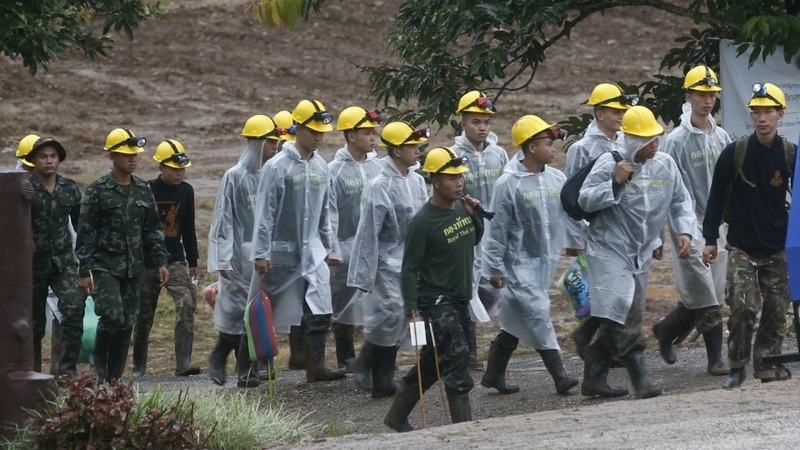 With those three words posted on Facebook the daring rescue mission to extricate 12 boys and their soccer coach from the treacherous confines of a flooded cave in Thailand came to a close on Tuesday -- a grueling 18-day ordeal that claimed the life of an experienced diver and riveted people worldwide. Thailand's Navy SEALs, who were central to the rescue effort, celebrated the feat with a post that read: "All the thirteen Wild Boars are now out of the cave," -- a reference to the boys' soccer team. "We are not sure if this is a miracle, a science, or what." Eight of the boys were rescued by a team of Thai and international divers on Sunday and Monday. On Tuesday, the final four boys were brought out, along with their coach. 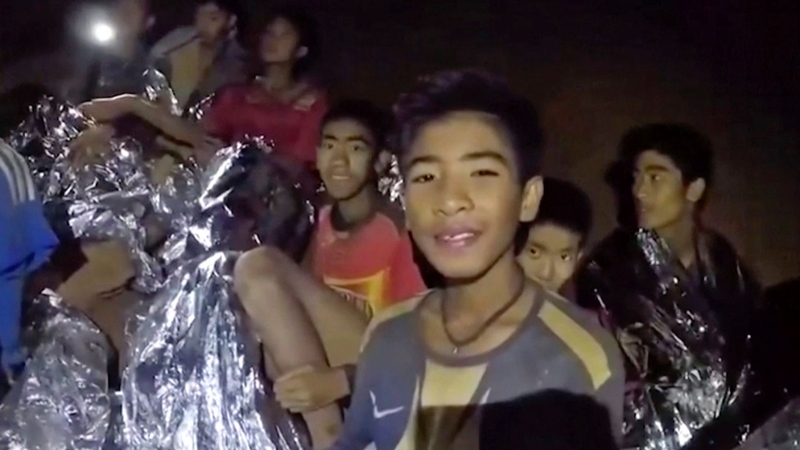 Their rescue was followed a few hours later by the safe return of a medic and three SEAL divers who had stayed for days with the boys in their cramped refuge in the cave. Cheers erupted from the dozens of volunteers and journalists awaiting news of whether the intricate and high-risk rescue mission had succeeded. Helicopters transporting the boys roared overhead. People on the street cheered and clapped when ambulances ferrying them on the last leg of their journey from the cave arrived at a hospital in Chiang Rai city. Their joy and relief was echoed around the globe by the multitude of people who had watched the long ordeal in widely broadcast newscasts. Payap Maiming, who helped provide food and necessities to rescue workers and journalists, noted that fact. "I'm happy for Thais all over the country," he said. "And actually just everyone in the world because every news channel has presented this story and this is what we have been waiting for." "It's really a miracle," Payap said. "It's hope and faith that has brought us this success." Amporn Sriwichai, an aunt of rescued coach Ekkapol Chantawong, was ecstatic. "If I see him, I just want to hug him and tell him that I missed him very much," she said. The plight of the boys and their coach captivated much of the world -- from the heart-sinking news that they were missing, to the first flickering video of the huddle of anxious yet smiling boys when they were found by a pair of British divers 10 days later. 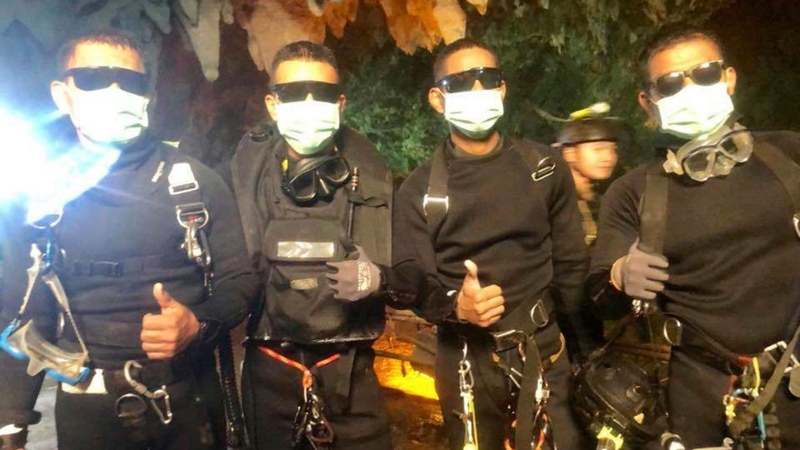 They were trapped in the sprawling Tham Luang cave in northern Thailand on June 23, when it became flooded by monsoon rains as they were exploring it after soccer practice. Each of the boys, ages 11 to 16 and with no diving experience, was guided out by a pair of divers in the three-day high-stakes operation. The route, in some places just a crawl space, had oxygen canisters positioned at regular intervals to refresh each team's air supply. 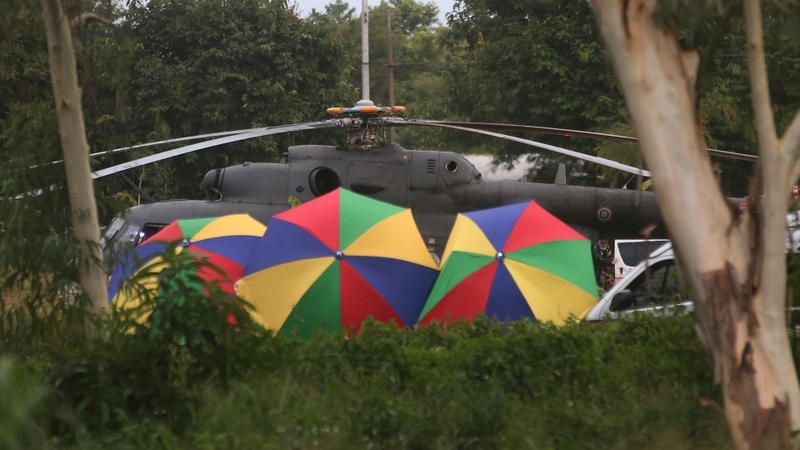 But Thai officials, acutely aware that the boys could be trapped for months by monsoon rains that would swell waters in the cave system, seized a window of opportunity provided by relatively mild weather. A massive water pumping effort also made the winding cave more navigable. The confidence of the diving team, and expertise specific to the cave, grew after its first successful mission Sunday. 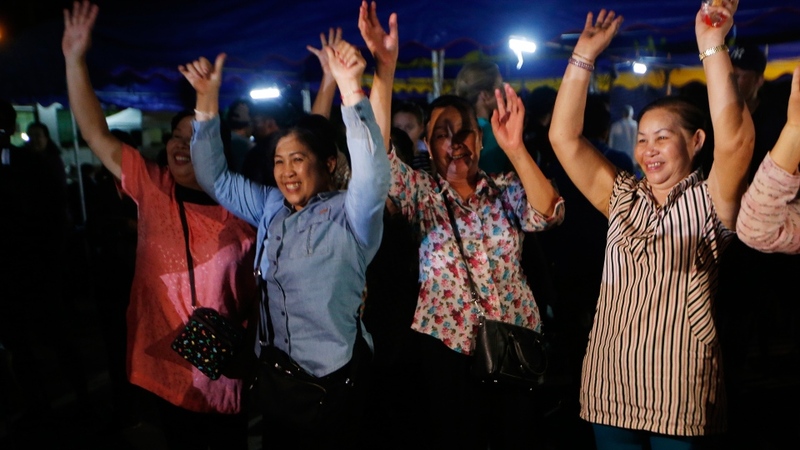 "We did something nobody thought possible," Chiang Rai province acting Gov. 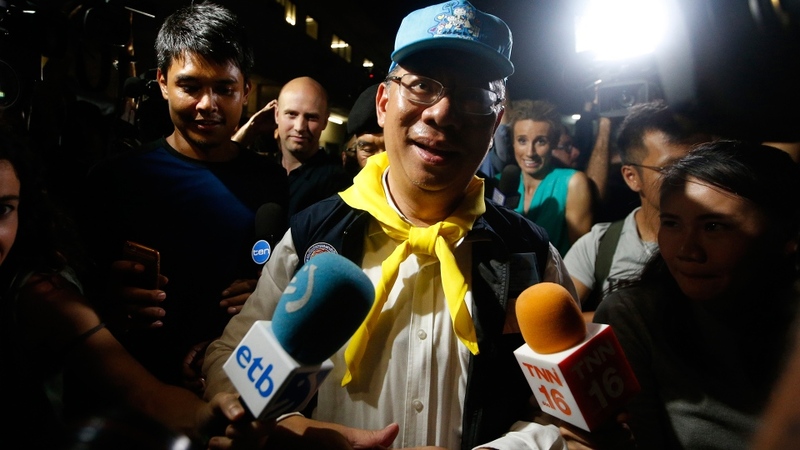 Narongsak Osatanakorn, leader of the rescue effort, said at a celebratory news conference. Asked at a news conference in Bangkok if the boys had been sedated, Prayuth said: "Who would chloroform them? If they're chloroformed, how could they come out? It's called anxiolytic, something to make them not excited, not stressed." The eight boys brought out by divers on Sunday and Monday were doing well and were in good spirits, a senior health official said. They were given a treat on Tuesday: bread with chocolate spread that they had requested. Jedsada Chokdumrongsuk, permanent secretary at the Public Health Ministry, said the first four boys rescued were now able to eat normal food, though they couldn't yet take the spicy dishes favoured by many Thais. Two of the boys possibly have a lung infection but all eight are generally "healthy and smiling," he said. "The kids are footballers, so they have high immune systems," Jedsada told a news conference. "Everyone is in high spirits and is happy to get out. But we will have a psychiatrist evaluate them." It could be at least a week before they can be released from the hospital, he said. For now the boys were being kept in isolation to try to keep them safe from infections by outsiders. But family members have seen at least some of the boys from behind a glass barrier. It was clear doctors were taking a cautious approach. Jedsada said they were uncertain what type of infections the boys could face "because we have never experienced this kind of issue from a deep cave." If medical tests show no dangers after another two days, parents will be able to enter the isolation area dressed in sterilized clothing, staying two meters (yards) away from the boys, said another public health official, Tosthep Bunthong. "If this place had a roof, the morale has gone straight through it," he said. President Donald Trump joined those paying tribute to the rescuers. "On behalf of the United States, congratulations to the Thai Navy SEALs and all on the successful rescue of the 12 boys and their coach from the treacherous cave in Thailand," he tweeted. "Such a beautiful moment -- all freed, great job!" One of soccer's most popular teams, Manchester United, expressed its relief over the rescue and invited the boys and their coach, as well as those who saved them, to come see the team play on their home ground this season. A message posted on the English Premier League club's Twitter account said: "Our thoughts and prayers are with those affected. We would love to welcome the team from Wild Boars Football Club and their rescuers to Old Trafford this coming season." The international soccer federation, FIFA, had already invited the boys to attend the World Cup final in Russia this Sunday. However, doctors treating the boys said it was too soon for them to make the trip. 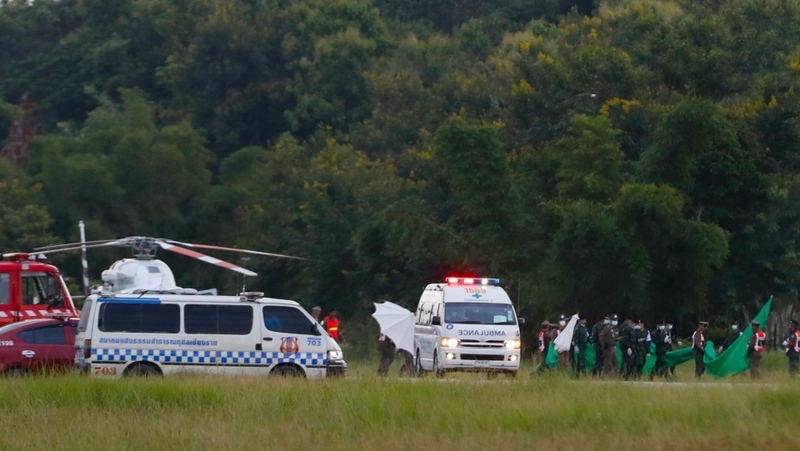 Day 3 - #ThaiCaveRescue off to a tough start. Rain has started falling around cave site. Health officials reporting 2 of first 4 boys could have lung inflammation - watching for cave disease. Several reports - 9th boy is out!